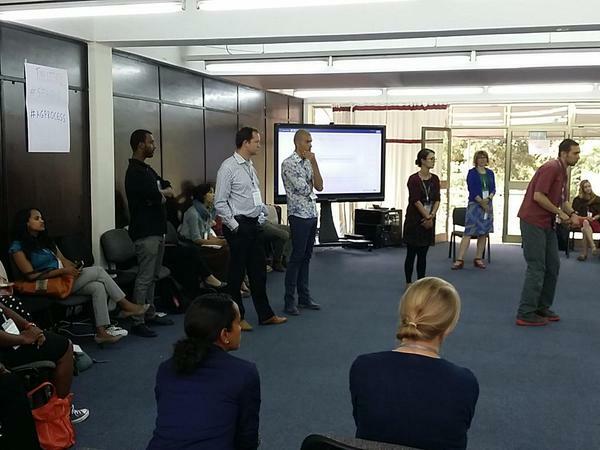 Earlier this week, we supported 4 sessions from the Agknowledge Share Fair in Addis with options for remote participation. As well as giving people that could not travel to Addis the opportunity to participate in part of the event, for us this was also an occasion to experiment more with Adobe Connect and how to use it to support online and offline events - and blend them together. In designing the remote participation, we had decided to try with different formats and modalities of e/participation. A blended session with activities in parallel on site and with a fully blended group, with two people from Addis joining three online participants into Adobe. We probably all knew this before but experimenting to bring remote participation into a face to face meeting confirmed how interactions and exchanges have a very different pace, online and offline. In the former, the feedback loops are much slower. Because interactions work differently online and offline, running the two in parallel is easier to manage. You can have the same activities F2F and online, but these may have to be facilitated in different ways. For example, you may go through a set of 1 to 1 chats between physical participants, while having a group chat with all virtual participants. The exchange and cross over between online and offline can be done in the debriefing sessions. It’s very different is when you try to have physical participants interacting in small groups with online participants. This requires a lot of preparation, and an optimum use of the technology, not only to avoid sound issues but also to make sure participants can interact using text, video and voice. Depending on the type of e-participation that you want to enable from a face to face meeting, you may need different people being part of your facilitation team: two facilitators (one onsite and one online), one technical host and, if the onsite facilitator isn’t experienced with blended meetings, one ‘blender’ who connects online and offline from the physical meeting room. Always be prepared for what can go wrong. For example, in one occasion we lost the video and audio feed from the room - it’s important to have ways to notify participants immediately, and be ready to fill in this gap with other activities. We’ll keep on reflecting on this experience and experimenting with tools, approaches and facilitation techniques, and we’ll make sure we share our findings here. Let us know what your experience is with blended online offline meetings and what we can learn from other experiences.